New Year's Eve can be a fun and exciting experience for kids as well as adults. There are many activities that can make the evening enjoyable for children. And you can easily sneak in some activities that include reading. For your New Year's party, you may want visit our Reading Games page for games such as Bingo, Concentration, and Silly Sentences. A word search can be a fun reading activity. A New Year's Word Search is a great way spend some time on New Year's Eve. 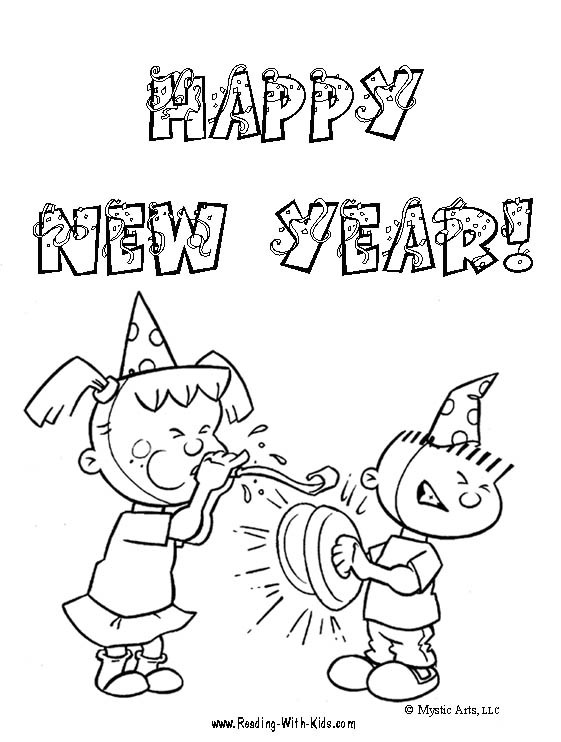 Your kids may also enjoy a free printable New Year's coloring page. For more coloring fun, visit our coloring pages. Probably the most common tradition associated with the New Year is making New Year's resolutions. Although this practice is more common among adults than children, it is also important for kids to learn the importance of setting goals. The earlier children learn to set and achieve goals, the more successful they will become at it. There are two types of goals. First, there are goals where a specific objective is to be accomplished. The second type of goal is an ongoing goal - something you want to do and continue doing indefinitely. 1. First, decide on an achievable goal and write it down. 2. If the goal is the first type (with a specific objective), determine when it can reasonably be accomplished. 3. Determine what steps will need to be taken to achieve the goal and when they can be performed. 4. Follow through with the goal. Although "follow-through" may seem like the last step in goal setting, it really is not. 5. Be sure to teach your children that an important part of goal-setting is evaluation. This is especially important for long range goals. Sometimes it will become necessary to determine whether circumstances have changed the timeframe or the steps necessary to accomplish the goal. Evaluate the goal as frequently as necessary. For some goals, this may be daily, for others it may only be required one time. Always evaluate the goal after its completion. Determine what things could have been performed better and which steps were performed efficiently. Following this process is a great exercise not only for accomplishing the goal that has been set, but it also instills confidence and an increased ability to accomplish future goals. You may also want to have your children sign their goal sheet - similar to signing a contract. Explain to them the nature of "signing" the goal and their responsibility associated with it. 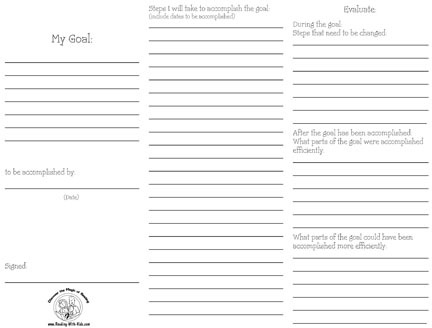 You may like to download our free printable goal planner to help you with these steps. In order to view and print some of these activities, you will need Adobe Acrobat Reader. You can download it free from the Adobe webstie.